In this feature documentary the story of women in the post suffrage era changes our understanding of women’s political history in America. Of profound importance, it includes women in the historical narrative as never before. After winning the vote, women emerged from their suffrage networks and wielded unprecedented levels of influence and power in New York City, and on state and federal levels. They brought about progressive social change, and blazed the path for the modern feminist movement. Women learned how to negotiate power in their own unique ways prior to and immediately after national suffrage. In 1917 women in the state of NY won the right to vote, three years before the passage of the 19th Amendment. A year later, in 1918, a woman named Belle Moskowitz became one of Governor Al Smith’s closest advisors. By the time Smith was running for president in 1928, Moskowitz was wielding more political power than any woman in the United States. Now generally forgotten by the public, in her day, Belle Moskowitz was considered an almost legendary figure. During Smith’s eight years in office, Belle proposed and helped execute a plan to re-structure the state government. She hired and trained then unknown, Robert Moses who would form a bond with Smith that would transform public works in New York state. Belle Moskowitz was a major force in shaping Smith’s entire legislative agenda, including programs that were precursors of President Roosevelt’s New Deal. 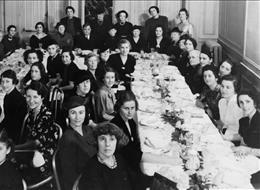 During the 1920s and 30s, politically active women were deeply engaged in reorganizing the state government, reforming the city charter and municipal justice system, creating low-income housing, establishing maternity and infant care, advancing women’s legal and reproductive rights, restricting child labor, and creating a minimum wage. In the 1930s women were at the forefront of inquiries into the court scandals that brought down mayor Jimmy Walker, swept Fiorello La Guardia into office, reduced the power of Tammany Hall and modernized the city’s administration. During his twelve years in office, La Guardia appointed over one hundred women into his administration’s leadership ranks. In addition to this hotbed of activity in New York, opportunities for women greatly expanded in Washington in the New Deal era. Women such as Molly Dewson pushed for minimum wage. Head of the Women’s Division of the Democratic National Campaign Committe Dewson was credited with placing many of the high-ranking women in the Roosevelt Administration. In this era Jane Bolin became the first African American women in the nation to become a judge, and Mary McLeod Bethune an advisor to the President. Frances Perkins became the first women appointed to a presidential cabinet. The Secretary of Labor became known as the architect of the New Deal. She forged the blueprint of legislation finally enacted as the Social Security Act. Signed into law by the President in 1935, the Act included a system of old age pensions, unemployment compensation, workers’ compensation and aid to the needy and disabled. Armed with the vote, these women harnessed the political party system to bring about progressive social and political change and served as the role models for the generations of political women to come. The suffrage era and the feminist movement of the 1960s and ’70 have been covered. This film fills that gap and will certainly peak the interest of the public if it can coincide with the suffrage centennial in 2020.